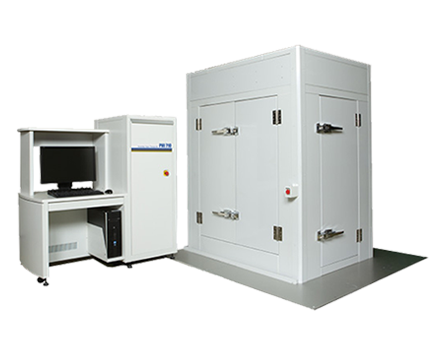 The PHI 710 Scanning Auger Nanoprobe is a unique, high performance Auger Electron Spectroscopy (AES) instrument that provides elemental and chemical state information from sample surfaces and nano-scale features, thin films, and interfaces. Designed as a high performance Auger, the PHI 710 provides the superior Auger imaging performance, spatial resolution, sensitivity, and the spectral energy resolution needed to address your most demanding AES applications. PHI’s coaxial electron gun and analyzer geometry provides the sensitivity and unobstructed vision needed to fully characterize the microstructures that exist on most real world samples with Auger Electron Spectroscopy. In this example, Auger data is obtained from all sides of particulates and between particles with equally high sensitivity. Instruments with non-coaxial geometry suffer from geometric effects that dramatically reduce instrumental sensitivity and even create shadows that prevent any analysis in some locations. In this example high sensitivity is only observed on areas of the particles that face the analyzer, while the back side of the particles and the areas between particles are inaccessible because of analyzer shadowing that occurs in an instrument with non-coaxial geometry. The secondary electron image in figure A shows the microstructure of a ductile iron fracture surface including graphite nodules and craters where graphite nodules have fallen out as a result of the fracture. The AES maps in figure B show the ability to map across the graphite nodule and the crater where Sn has segregated to the nodule/iron interface. The SE image and AES maps in figures C and D show the complex composition of a small precipitate observed in figure B. Only PHI Auger instruments with coaxial electron gun and analyzer geometry provide such a complete compositional picture of a micro-structured sample surface. The sample shown in the SEM image contains a defect that appeared in a thin nickel film deposited on a silicon substrate after it was annealed to form a nickel silicide at the interface. Multi-point depth profiles obtained with a 20 nm diameter electron beam for analysis and a 500 V Ar ion beam for sputtering were acquired using high energy resolution (0.1%) on and off of the defect. Linear least squared fitting software was used to isolate the Ni metal and Ni silicide spectra as well as the Si metal and silicide spectra. It can be noted that Ni silicide is found only at the interface and not in the Ni film or in the Si substrate at point 1, which is off of the defect. However, in the defect area at point 2 a complex multi-phase Ni silicide is observed throughout the defect in the Ni coating. Intuitive, fully integrated, Windows™ software platform controls all instrument functions. Color overlay of elemental silicon (green), silicide (red) and silicon oxynitride (blue) images created using the Linear Least Squares fitting algorithm in MultiPak to extract multiple silicon chemical state images from the elemental silicon image. PHI MultiPak is the most comprehensive data reduction and interpretation software package available for electron spectroscopy. The tasks of spectral peak identification, quantification, extracting chemical state information, detection limit and image enhancement are addressed with an array of powerful and easy-to-use software tools for spectra, line scans, images and depth profiles.